In Abood v. Detroit Board of Education, 431 U.S. 209 (1977), the Supreme Court held that the First Amendment does not prohibit “agency shop” arrangements under which state employees who decline to join a public-sector union are required to pay an agency fee to support union work that is related to the collective-bargaining process. In two recent decisions, the Court expressed doubt about Abood’s continued validity but did not expressly overrule it. See Harris v. Quinn, 134 S. Ct. 2618 (2014); Knox v. Serv. Employees Int’l Union, 132 S. Ct. 2277 (2012). Today, the Court granted certiorari in Friedrichs v. California Teachers Association (No. 14-915) to consider whether to overrule Abood and declare public-sector “agency shop” arrangements unconstitutional. Friedrichs was brought by California public school teachers to challenge the state’s union laws. California law permits public school employee unions to establish “agency shop” arrangements within their school districts and thereby require all employees, “as a condition of continued employment,” either to join the union or to pay an agency fee. According to the law (and consistent with Abood), however, agency fees can be used only for activities “germane” to collective bargaining. Unions therefore must notify nonmembers about which portion of their fees will and will not go to such activities; nonmembers may avoid the “non-chargeable” portion of the fees only by affirmatively objecting to them. Plaintiffs’ complaint challenged both the agency-shop arrangement and the opt-out procedure, arguing that they violated plaintiffs’ rights to free speech and association under the First Amendment. The case arrives at the Supreme Court with little procedural history. 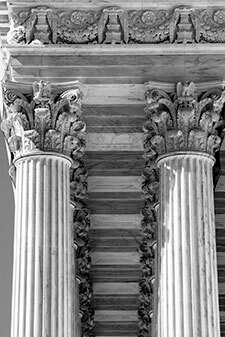 Recognizing that both claims were foreclosed by binding precedent (the first by Abood and the second by a Ninth Circuit decision upholding similar opt-out procedures), plaintiffs moved for judgment on the pleadings in favor of defendants. The district court granted judgment to defendants pursuant to plaintiffs’ request, and the Ninth Circuit summarily affirmed. Relying on Harris and Knox, the petition for certiorari principally focuses on overruling Abood. The petition argues that public-sector unions’ collective bargaining is materially indistinguishable from political speech and thus its compelled subsidization can be justified only by a sufficiently compelling state interest. According to the petition, the state’s interests in labor peace and preventing non-members from “free-riding” on the collective-bargaining efforts of the unions do not justify agency-shop arrangements. Alternatively, the petition contends that California’s opt-out procedure imposes an unconstitutional burden on plaintiffs’ First Amendment rights. If the Court overrules Abood, its decision will have far-reaching ramifications for public-sector union membership and on the collective-bargaining regimes of the more than twenty states that use agency-shop arrangements. It may also reflect a more fundamental shift in the Court’s approach to unions and collective bargaining, with consequences for private employers as well. Absent extensions, amicus briefs in support of the petitioner will be due on August 21, 2015, and amicus briefs in support of the respondent will be due on September 21, 2015.